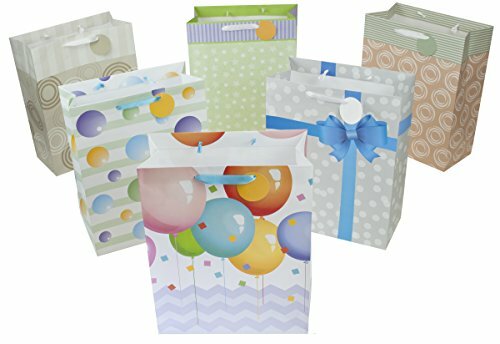 12 Large Designer Gift Bags 16''Lx12''Wx6''D, Best Value Assorted Designs by Heart Paper Products by Heart Paper Products at Designers Artists. MPN: FBA_HPPB002. Hurry! Limited time offer. Offer valid only while supplies last. High-quality designer gift bags for any special occasion. This assortment of 12 bags comes in 6 exclusive designs by Heart Paper Products Company. High-quality designer gift bags for any special occasion. This assortment of 12 bags comes in 6 exclusive designs by Heart Paper Products Company. Highlight and distinguish your gifts from the rest. Value pack of one dozen high-quality giftbags featuring 6 exclusive designs by Heart Paper Products. Created with silky ribbon handles and gift tags for personalized messages. Reinforced with white cardboard on the base to ensure a flawless presentation of your gift. Best Value! Stock up now to be prepared for any occasion throughout the year. Great for birthdays, graduations, baby & bridal showers, and holidays! If you have any questions about this product by Heart Paper Products, contact us by completing and submitting the form below. If you are looking for a specif part number, please include it with your message.